Not really, of course. 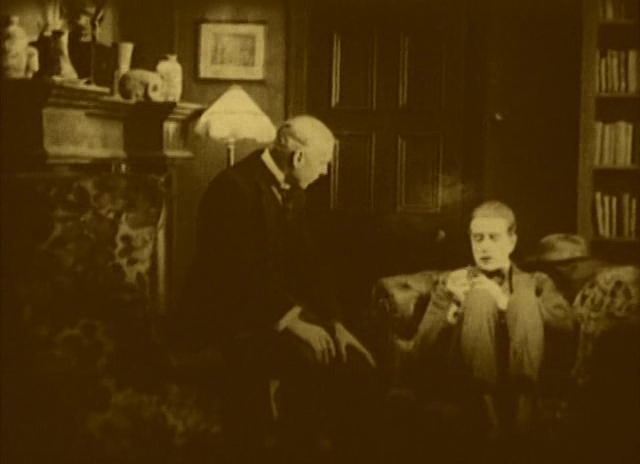 This is from THE MAN WITH THE TWISTED LIP, produced (and presumably directed) by Maurice Elvey in 1921, in which Eille Norwood plays Holmes — I enjoyed the way he sits. This entry was posted on April 17, 2011 at 10:15 am and is filed under FILM with tags Arthur Conan Doyle, Maurice Elvey, Sherlock Holmes, The Man With the Twisted Lip. You can follow any responses to this entry through the RSS 2.0 feed. You can leave a response, or trackback from your own site. Apparently almost all the films survive and are held by the BFI, but the rights belong to one of Andrew Lloyd Webber’s companies. Lord Webber should really get off his duff and release them. The Norwood versions of The Dying Detective and The Devil’s Foot have been released on a dvd set called “Sherlock Holmes: The Archive Collection Vol. 2” but I have no idea what their visual quality is like. Similar to my copy of Twisted Lip, I think — dim but watchable. Cripes! Doesn’t Jeremy Brett sit like that in… grrr… The Navel Treaty? I found the opium den in Footlight Parade was rather….inviting. Yes, those are delightful places. We watched Dwain Esper’s Narcotic last night, where the den is a brick cellar (how Esper must have loved cellars) and I was trying to explain to Fiona why my normal expectation of drug dens is cheerier. The Limehouse dens, as written by Conan Doyle and Sax Rohmer, were rather déclassé, so I doubt I’d visit those. Give me showgirls in spangles lolling around elegant surroundings and I’ll happily spend time there, though I admit second-hand smoke might be a problem. The Esper Den, where without doubt much perversity would take place, could be a interesting visit. Esper’s places never seem that attractive. Nor do his people. All that appeals really is the sense of spatial derangement. This one starts with a roomful of paunchy shirtless men, gradually resolving down to one shirtless man, as you realize that the random, line-crossing camera placement has created a hall of mirrors effect upon his flabby torso. Flabby torso? Honest, it wasn’t me! I remember seeing a “joys of nudism” film of the ’30s, where every single woman looked like an out-of-work ingenue. “Opium den” has such a musty, 19th c., grotto-y sound to it. I much prefer the “international style” sounding “shooting gallery”; all white, spanking new, with a touch of chrome. Well thank goodness for the british gift of gab now..I often find myself selecting current dvds to rent that are old briny in hopes that someone will talk ..and talk well..It dosen’t often happen in hollywood these days. One of my fave opium den scenes..kicking the gong around..is the tent den in Mad Dog Morgan in the better uncut versions. I don’t think there’s that much brilliant talk in modern British stuff. I don’t know why not, since talk is proverbially cheap. 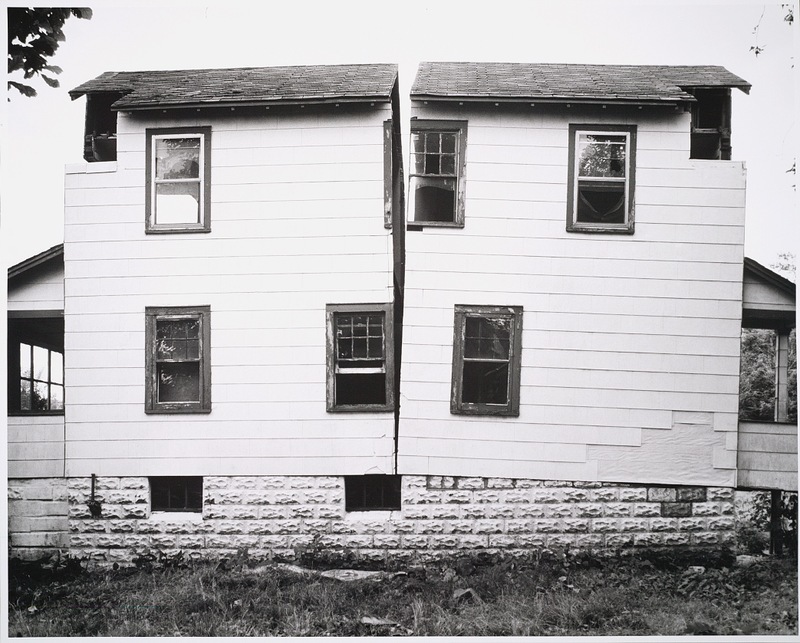 Tom, how about “crack house”? Ah, kicking the gong around, also the title of a drugged-up Cab Calloway number in The Big Broadcast. Much more extreme than Reefer Man, Cab even mimes snorting coke. BTW, the film is good, too. Wow, I enjoy parts of the Big Broadcasts I’ve seen, but I wouldn’t say any of them hang together. The first one does? Must check it out. Well, don’t expect it to be as structured as a dramatic film or even a narrative comedy considering the genre (i.e. they have to get all those songs in sometime). Of course it’s also silly at times and nobody will like all the musical numbers (one is Joyce Kilmer’s Trees put to music), but it has a tighter plot and sticks to it better than others I’ve seen. Besides star Crosby, Calloway is quite obviously showcased – his band gets two numbers, one instrumental early in the film and the aforementioned Kicking The Gong Around number late. Also, director Tuttle tilts the camera more than Roy Del Ruth ever dreamed of doing and for mainly comic sequences, which I hadn’t seen done so early. Also, too there’s some small bits of animation.